This is the outfit that I wore for the Epcot day of my recent trip to Orlando for Spring Break! This was my fourth visit to Disney World- I had previously been when I was ages 2 and 6, and then for a quick trip while my dad had a work conference at a Disney hotel when I was in 10th grade. It was visiting Epcot again in high school that I truly fell in love with this park! I love the focus on geography and culture- getting to visit the different countries of the world is so much fun! And I enjoy the rides at Epcot the best out of the other parks I think. I knew that since Epcot is my favorite Disney park, I wanted to wear an outfit that while being functional and comfortable, would also be cute and appropriate for the plethora of pictures that I knew would be happening. So enter this perfect romper! I could not have picked a more perfect outfit for exploring a Disney park. 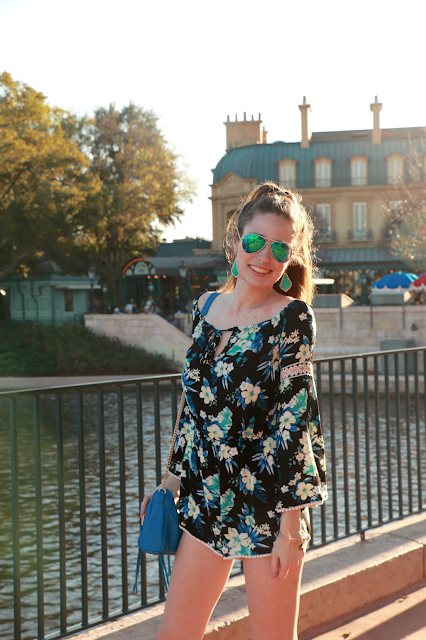 This romper is lightweight and great for Florida sunshine, but the long sleeves still helped me to stay warm after the sun went down that evening. The print and colors on it are absolutely gorgeous, and it's super comfy to wear! It actually comes in two different prints, and I had such a hard time deciding which one I would purchase because they were both equally adorable. That is always a good problem to have I guess! Also- I have to give a quick thank-you and shout-out to my friend Caroline and my dad (my travel companions) for being so patient with me as I found the perfect spot to shoot these photos in!! It took me a good fifteen minutes to move all around this area, messing with my camera settings and standing in different areas of sunlight. But when I found the specific spot, I knew I found the spot! How gorgeous is the light in these pictures?! A full recap of my trip to Orlando is coming to the blog next week, so stay tuned for that! That Romper is ADORABLE! I really need to add some more Rompers to my summer closet! Rompers are one of my go to outfits for spring and summer. 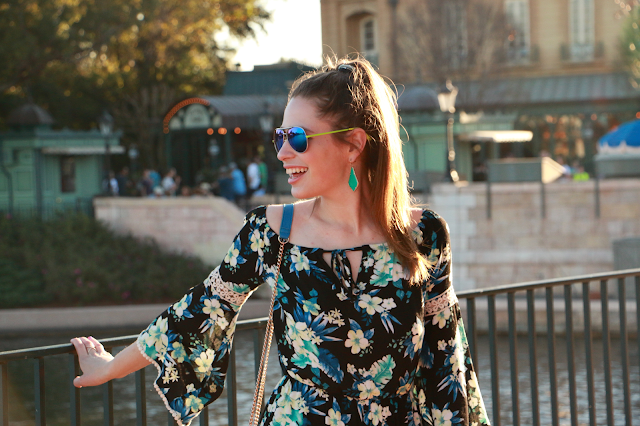 I love the style of this romper and it looks perfect for a day of fun at Epcot. This romper is so cute and so flattering! That romper is so cute! I think this is a perfect look for going to Disney! Epcot is such a fun park! I love your romper. You look super cute. Love this romper on you!!!! I've been trying to find a long sleeve romper that was equally cute and perfect for Spring and this is it! I think I need a romper like this. That romper is SO cute on you and perfect for a day at a theme park. It seems like you have been having such a great spring break! Gorgeous, Annaliese! 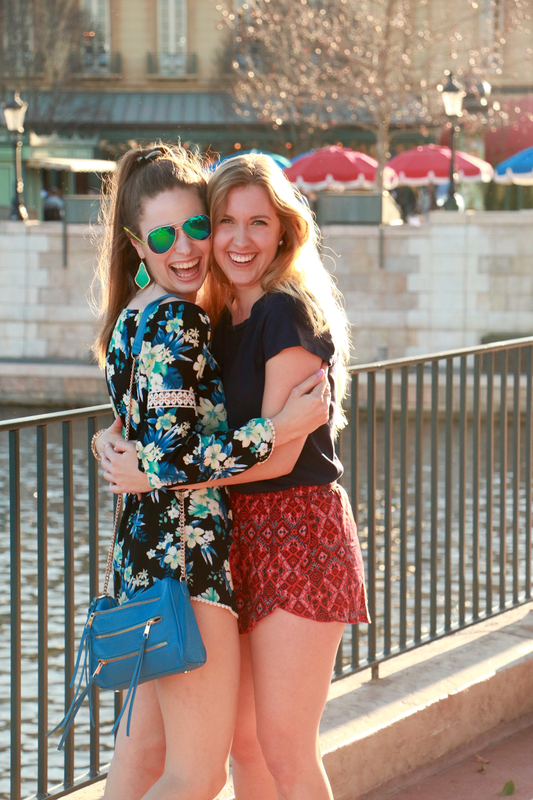 I love the color of your Kendra Scott earrings and can't wait to see the full recap of your trip! Love love love this romper and these pictures are gorgeous! Epcot has to be my favorite Disney park next to Magic Kingdom! Sounds like you had a great Spring Break!! Not only is this romper adorable, but I love how it coordinates with your blue bag! I wish I could pull off rompers as well as you do! Love it! I've never been to Epcot! When I visited Disney World, we decided to spend more time at Universal Studios rather than going to Epcot. I've always wanted to go though! I love love love your romper! Rompers are my favorite thing to wear during the spring time. These photos turned out great! Definitely worth the time it took to find the perfect spot and get your camera settings just right. Love your romper! Your trip sounds so fun. So cute! And so perfect for spring and summer! That romper is too cute! Love the sleeves!